The next time that you’re out DJ’ing a club or party, make sure that your that your laptop is outfitted properly. 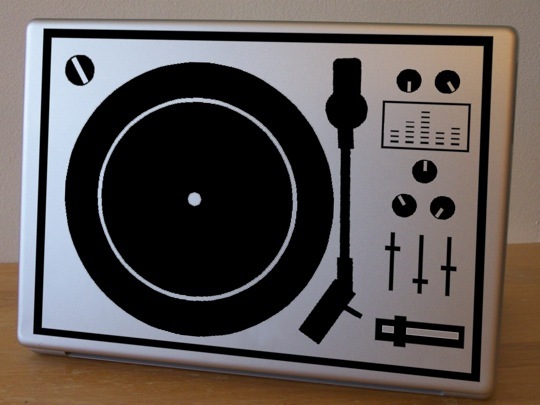 This turntable/mixer/DJ decal lets every one know that you’re dedicated, at least visually, to the art of DJ’ing. The removing decal is custom sized (approximately 12″ x 8″)according to your specs and available in a number of colors and vinyl finishes. Grab one for $11 over at Etsy. I will say it…these are WHACK. They don’t show much creativity and anyone who is going to go through the trouble of sticking something custom on your lappy should have a little more soul than this. Damn, you guys are harsh. My laptop says “I AM FUNKIER THAN YOU” on the back. Seriously, it does. for 11 bucks, you cant do no harm. Anyone know where to get a custom decal made? Also how hard would it be to remove these? Good afternoon,morning,evening,noon, I am happy to gain knowledge from your powerful passage discussed. I really have a wonderful time browsing it.